Description of the Squadron's Badge A broom. The broom was chosen to immortalise the frequent exhortation of Major 'Mick' Mannock, the famous World War I pilot, who served with the squadron, to "sweep the Huns from the air!" Squadron's Motto: Hostem acœlo expellere" (To drive the enemy from the sky). Wellington X crew at Foggia Main Italy. End of October 1944, this was taken after the crew had completed a tour of 33 missions. A well earned fag! 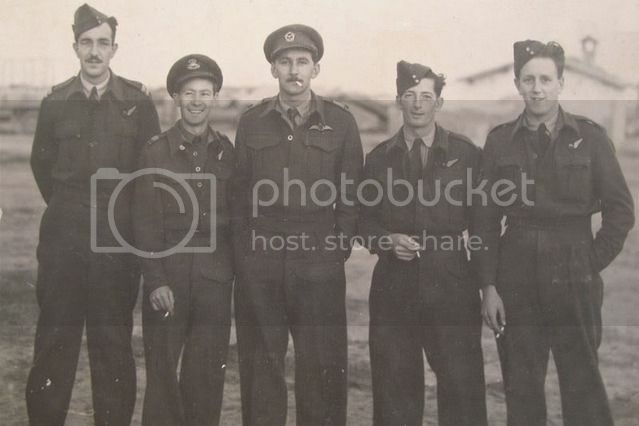 From left to right, Sgt N Mair (nav), F/O F Maccabee (w/o), 2L/t Bayley (pilot SAAF? ), Sgt R Strutt (b/a) and Sgt A Gibb (r/g and my Dad). Good to hear from you. I was the one who posted the photograph of the aircrew. My Dad is on the right, then Sgt A Gibb. I have tried to find some links to any of the crew. Dad passed away in 1996 and I never really asked all the questions I should have. I have Dad's log book together with aerial photographs of most of the targets. I have not been on this site for a long time but I do hope that this message gets to you. Welcome to the site mate, I'm so glad that you found a photo here of your dad, if I can help just shout. I am the son of R Strutt! I want to find out anything about my father while in 40 Squadron and any pictures. After the war he ddn't talk very much about it. He said he had lost too many close friends. I can not believe I have found a picture of my dad! I only have two while in the RAF. He sadly died in 1998.